A community group member has told how youngsters on rooftops along Main Street hurled heavy objects at passers by in a shocking incident. 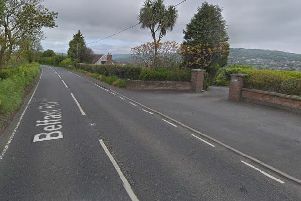 The Ballygally man told the Times that the group had just finished a meeting in a local cafe on Monday, August 29 when youths threw material at him and his companions from above. “I didn’t even say anything as I was so stunned,” Andy recalled. “We had just finished a meeting in which we were discussing ways to improve the town and when we came out at 9pm they were throwing heavy debris from the top of the DV8 building. “There was a group of about 15 girls and boys aged from about 13 to 15 years old on the roofs of the shops along Main Street. “It didn’t hit me but it did hit my car, and I think it produced a few scratches. After reporting the incident to the police, Andy returned to the scene the following day, and was again shocked to see a group of young girls on a nearby roof top in the middle of the afternoon. On this occasion, nothing was thrown at passers-by. “There was a smaller group of girls aged 12 to 13 jumping up and down on the roof of Superdrug at around 3.30pm,” Andy recalled. Andy says it is lucky that none of the youngsters was seriously injured as a result of their activities. “One slip from the top of the roof and a broken bone would have been the best case scenario,” Andy continued. “Even when the young boys were throwing things at us they were leaning over the roof and they could have fallen off. “You could be looking at a fatality here. “I think the parents must have no idea what their kids are out doing and they should talk to them about staying safe. “It’s quite ironic that while we were having a meeting planning how to improve the town those kids were out destroying it,” he concluded. “We have identified the means of access and an officer has went out to speak to local businesses regarding securing their properties to make sure no-one can get up there,” he told the Times. “This is the first time an incident like this has been reported to the police. Our patrols are keeping an eye on the situation on and around Main Street. The consequences of falling off a roof could be severe and anyone that we do identify or catch doing it will be dealt with. Sgt Lowry warned that young people participating in such activities could be handed a criminal record which would jeopardise their futures. “Going up there is civil trespass, and if criminal offences have been committed we will make sure they are dealt with. “At the moment we are trying to get into schools to talk about the dangers of drugs and anti-social behaviour at the beginning of the school term as opposed to mid term. that a criminal record could have on their future education, employment and ability to travel. Sergeant Lowry also advised parents to keep an eye on their children’s whereabouts. “Know where your children are and speak to them about what they are out doing,” he concluded.